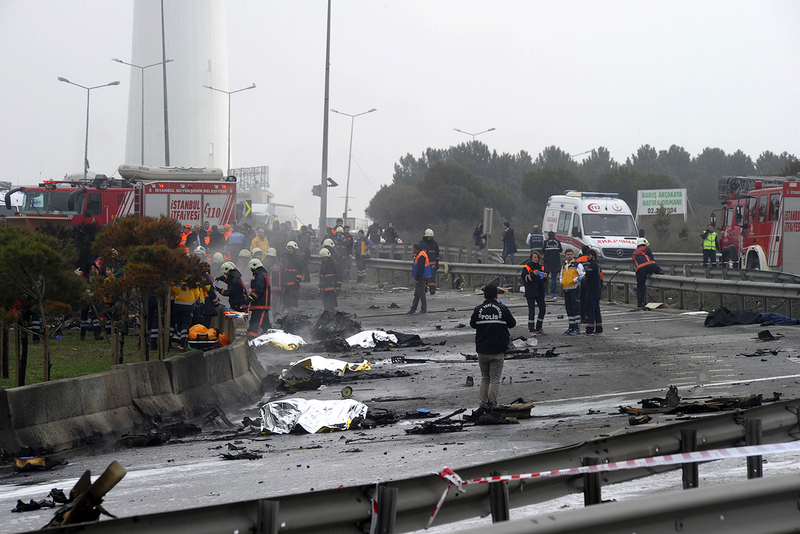 Firefighters work at the crash site of a helicopter as bodies lie covered with blankets in Istanbul on March 10, 2017. Crisis Management Center said on its Twitter page on March 10. "Turkey - five people, including four Russians, died while two persons were injured as a result of a helicopter crash in Istanbul," the Twitter message said. The passengers aboard the helicopter were guests of Eczacibasi Group. "According to data of the carrier company, these are Alexander Vanin, Igor Kochergin, Lyudmila Chuprova and Yelena Badragan. We can’t say so far, for which company they worked," a spokesman for Eczacibasi Group said on March 10, TASS reports. A Sikorsky S-76 helicopter departed Istanbul Ataturk Airport and crashed near Büyükçekmej at 11:21 am local time. According to various data, there were up to seven persons aboard the helicopter that crashed. At least five of them died. The incident occurred due to a strong fog, local media reports. There is preliminary information that five bodies have been found. The helicopter fell directly on the road, there were no cars on the road. The fog is strong, absolutely nothing is visible," Mayor Hasan Akgun said in a broadcast on Turkey's NTV. One of the passengers was Salim Özen, the CEO of Vitra Russia, a division of Eczacıbaşı Group, DHA reported. He was flying with four Russian partners from Istanbul airport to a meeting which was to take place in the Turkish city of Bozüyük near the Sea of Marmara, Sputnik News reports.